In February 2011, the country added 20.2 million wireless users and now has 791.38 million users. 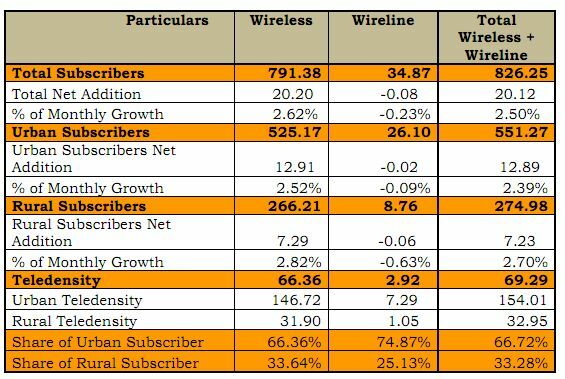 The share of rural subscribers has increased to 33.64% and overall mobile teledensity in India is now at 66.36%. In February, Vodafone added the most number of subscribers followed by RCOM and then Airtel. India has a total of 826.25 million telecom (wireless and landline) users as of February 2011, up from 806.13 million in January 2011. The overall teledensity is 69.29%. While urban populace is 66.79% of the total telecom base, rural users form 33.28%. Bharti Airtel's market share is now 20.9%, followed by Reliance Communications at 16.7% and Vodafone at 16.54%. 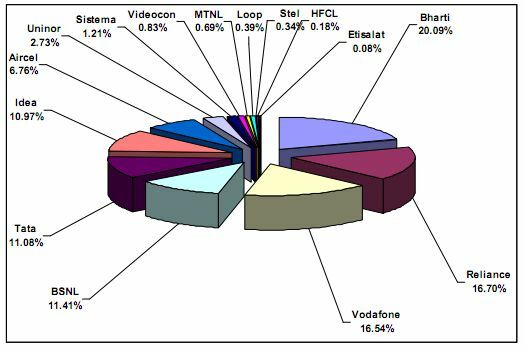 BSNL has 11.41% while Tata Teleservices has 11.08% market share followed by Idea with 10.97%. According to TRAI, the total broadband subscriber base rose from 11.21 million in January to 11.47 million in February 2011. TRAI defines broadband as any wireline connection offering download speeds greater than 256 Kbps. Landline userbase continues to slide, from 34.94 million in January 2011 to 34.87 million at the end of February 2011. You can download the official TRAI release from here.